Together we live out our faith through our family of Jubilee Ministries in our community and in our world through our commitment to the Millennium Development Goals. 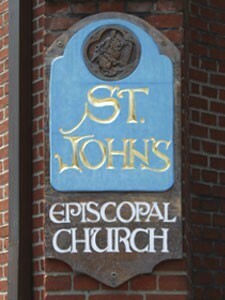 St. John’s was founded in 1853 at its present location on Chestnut and Mulberry Streets. 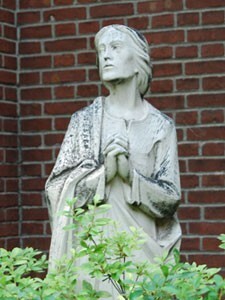 It was the first Episcopal congregation in Pennsylvania to be established without a pew rental system, and so was called St. John’s Free Church. Wealthy and poor parishioners were able to come together as equals in their worship of God, an unusual practice at that time for Episcopal congregations. The original church structure did not include the parish hall, the education wing, or the former rectory that you see today. These were added over the years as our church family grew and ministries and outreach increased. A fire in 1938 necessitated major renovation to the original structure. Today St. John’s, part of the Diocese of Central Pennsylvania, is a warm and vibrant urban church that retains many of the ceremonies and customs of its Anglo-catholic heritage, yet continues to welcome everyone as equals to God’s table. We invite you to share with us in more than 150 years of worship, community and service.